September 2017 – When Sears Canada filed for insolvency and announced they would cut pensions and health benefits as part of its corporate restructuring, CARP took action! Can all be solved without punishing those who worked hard for so many years? My husband, Rene, began working for Sears in the 1950s, literally building its stores from the ground up as a construction worker. He stayed on with the company as a maintenance worker. Rene was a clean freak!! Over the years, he studied for his mechanic license and worked for Sears doing various jobs, and finally managing special deliveries, things like furs, jewellery, and small appliances. He was the most honest, dependable person. Rene rarely took a sick day in all the years he worked for Sears. I can only remember maybe 2 or 3 days for dental surgery. In those days, you just got up and went. A cold didn’t keep you home. Rene worked from a very young age. After he finished grade 8, he went out looking for a job to support himself and his family. His mother lived in an institution and he couldn’t rely on his father. He learned to clean and cook on his own. Rene didn’t have much but he was a self-made man. I met Rene in 1958. I was 16 and he was 24. We dated almost four years then married on August 18, 1962. We didn’t have millions but we were never without food. He always took care of his family. At age 56, he was told he had to retire or he would lose his pension and benefits because they would fire him. The year he retired, 1996, he was disappointed, as he wanted to work until the age of 60. 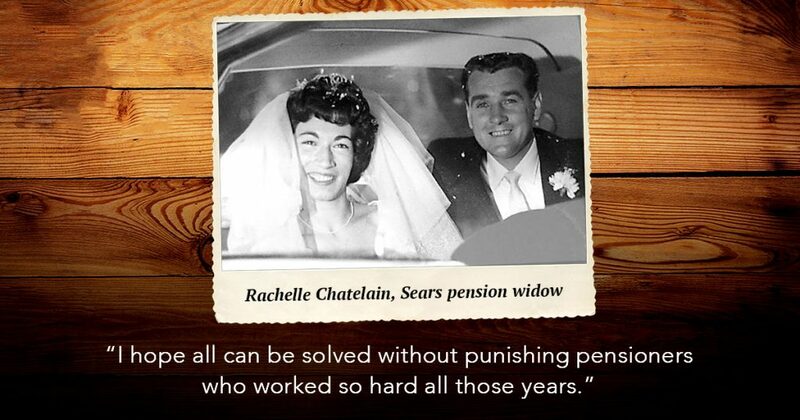 At age 65, his pension dropped to a very small amount but we managed with CPP, OAP, and Profit Sharing from Sears. After Renee passed away in 2005, at 70 years old, I continued to receive a very modest pension. I’m not destitute but my benefits are worth gold to me. Hopefully, Sears won’t take away the health benefits as I am now going on 75. Rene put his heart into Sears. He worked as if it were his own company. 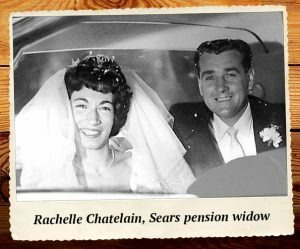 If he were alive today, this would be tough for him to take – how Sears is treating of its former employees and pensioners. It is a sad story for Sears to take away from those who helped build their company, as they used to be one of the best companies to work for. I hope that all can be solved without punishing all the people who worked hard all those years. Sign the petition to protect pensioners. I have gone on with my life with success because Rene always made sure that I knew about everyday living expenses. He gave me the most he could with love. I have nothing but the best of souvenirs of our life together. We have our only son, Jacques, and his partner Lyne, and two most precious grandchildren, Amanda who turned 20 on Sept 23rd and Nicholas, a great hockey player and golfer, who will be 16 in January. Thank you, and CARP, for taking the time to read my letter and support the petition to protect pensioners and their families. I hope sharing my story will help in some small way.